Take a road trip through the Midwest, and you’re likely to pass any number of various sideshow attractions: from the National Hobo Museum in Britt, Iowa, to the magic capital of the world in Colon, Michigan; Lamar, Missouri’s birthplace of Harry Truman, to Riverside, Iowa’s future birthplace of Captain James T. Kirk. Trekkies and hobo-enthusiasts alike can rejoice over Midwest attractions, yet one variety stands above the rest, usually literally. From twine balls to rocking chairs, mailboxes to concrete garden gnomes, the Midwest proudly boasts a number of the World’s Largest Somethings, but why? Casey, Illinois, is a town comprised of one main street flooded with small, niche businesses. The city hall is approximately the same size as the café across the way. A McDonald’s and Casey’s General Store (no relation to the town) sit as the only recognizable chains on the outskirts of town, while the other restaurants include a tiny Mexican food place staffed by two middle aged men who sit and play backgammon on a Friday afternoon, an unassuming pizza parlor in what could just as easily be an office building, and an old barn turned family-style restaurant. On my trip, a single police officer sat in the same location near the used car lot, unphased by the empty streets that lay before him. As we drive around, houses are falling apart along the outskirts of town — windows are boarded up, paint chips and peels, and foundations are crumbling. It’s unimpressive and baffling. All of Casey exists within slightly over two square miles with 2,750 people, according to the city’s website. 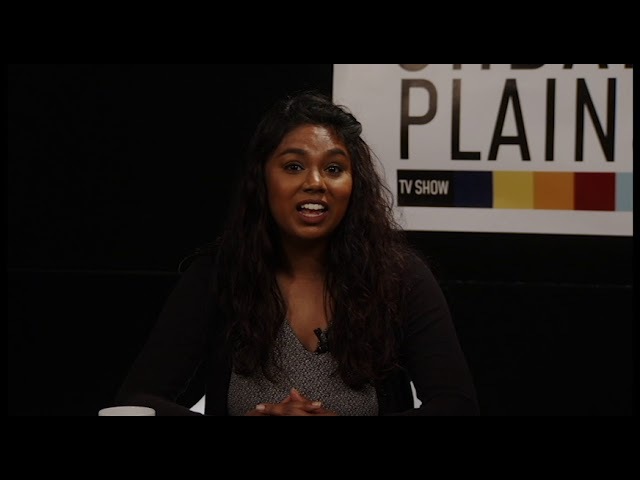 But Casey has one big thing going for it, and that big thing creates a lot of other big things. Just next to the country club on the eastern side of town sits Bolin Enterprises, Inc., a pipeline and tank maintenance company that was founded in Casey. After 30 years of success, it was time to give back to its hometown, in this case by constructing oversized items throughout the town: Casey is currently home to eight Guinness World Record titles and sports numerous other oversized items located sporadically throughout the town. 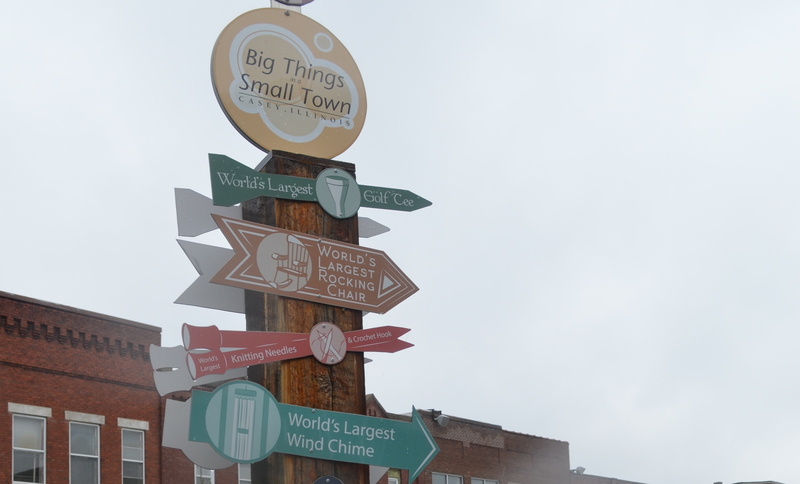 The project started with the World’s Largest Wind Chime that was built outside of the Whitling Whimsy Café in the center of town. 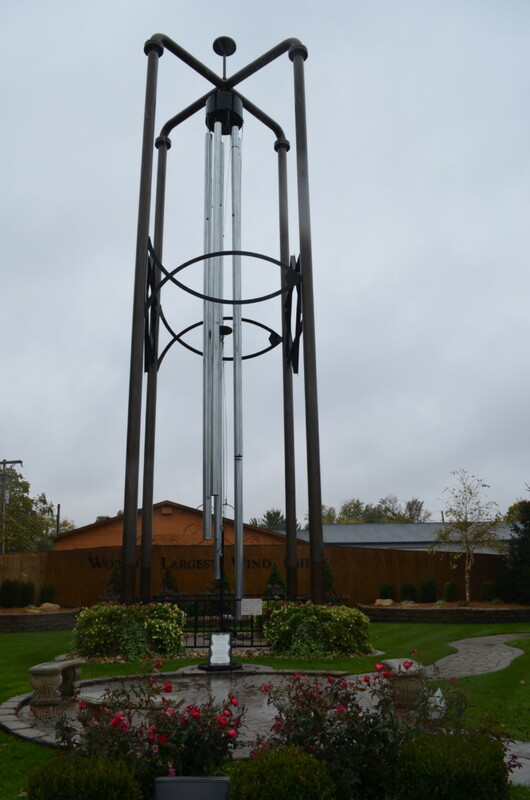 The wind chime, like the other seven world record holders in Casey, comes from Jim Bolin, the vice president of Bolin Enterprises. Originally, Bolin only planned the wind chime. With the community still struggling, he specifically was looking at creating something to help the Whitling Whimsy, a family business. Bolin said he wanted to create something that would bring people to more than just the café. When thinking of what to build, Bolin says he thought of his grandmother who loved wind chimes. As a pipeline company, it also happened to be an easy undertaking. 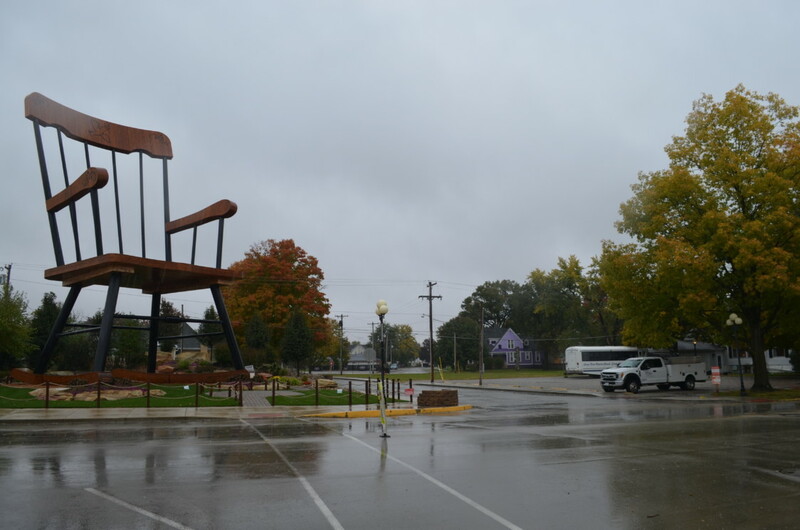 Along with the wind chime, Casey boasts the world’s largest rocking chair, knitting needles, crochet hook, mailbox, golf tee, pitchfork, and wooden shoes. Many are positioned near or in relevant businesses, like the golf tee at the country club, the knitting needles and crochet hook in a craft shop, and the shoes inside of Casey’s Candy Depot. Bolin says one of his next projects is an attempt at the World’s Largest Barbershop Pole to be located outside of the local barbershop. While Bolin and Bolin Enterprises’ employees still have their hands full with other projects, creating big things is a way to keep them busy when the company is short on other projects. It’s also a way to keep the small town of Casey on the map. In a region boasting a lot of Guinness World Records for the world’s largest items, four Midwest cities are entwined in a battle for one of the titles. 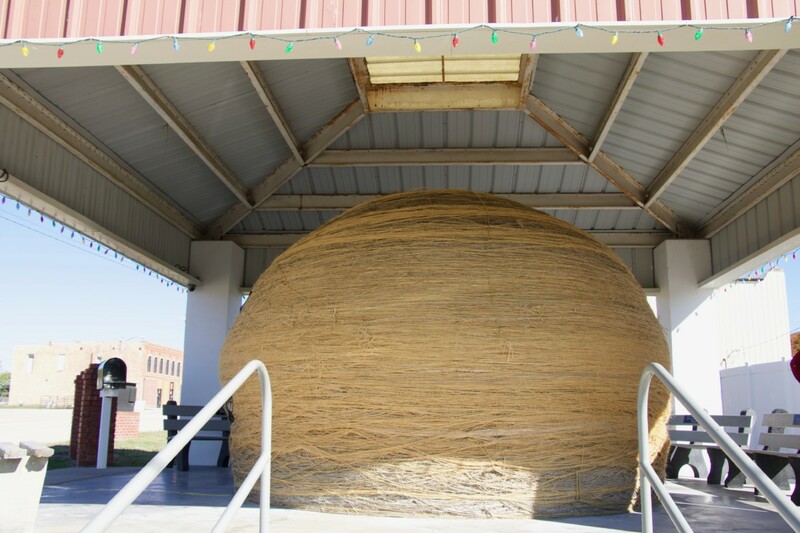 Cawker City, Kansas, Branson, Missouri, Darwin, Minnesota, and Lake Nebagamon, Wisconsin, all claim some variation of the World’s Largest Ball of Twine. 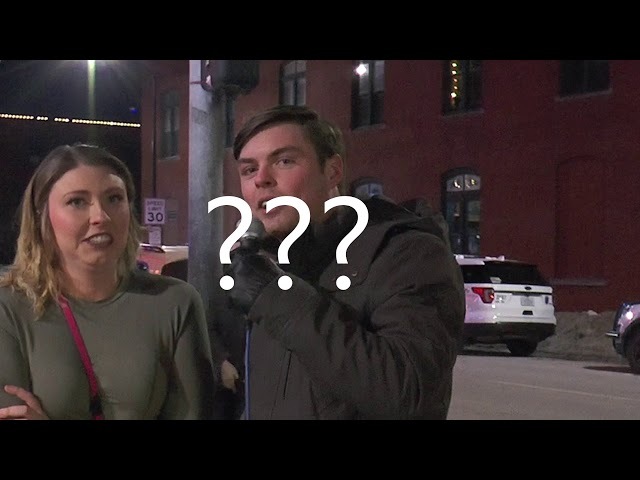 Why the Midwest? To start, it has a lot of twine. “The ball exists because a man was cleaning out his barn,” says Linda Clover, the care keeper of the Cawker City twine ball. Frank Stoeber was the original architect of the ball beginning in 1953. But after seeing how much twine he had, his neighbors, who were also farmers with a twine surplus, started adding theirs as well. By 1961, the ball was becoming too big for Stoeber’s barn and was brought in to town where it still resides with a small gazebo constructed around it. Even after Stoeber passed away in 1974, the town has continued the tradition of adding more of the same sisal twine. Clover says that people have come from all over the world to see and add to the ball. One memorable 90-year-old woman from Tasmania mailed in four feet of twine to be added since she couldn’t make the trip herself. If you don’t run into Clover, almost anyone in town can point you toward someone else who can supply you with twine. Visitors can also bring their own to add, though recording it with Clover will help keep the record up to date. 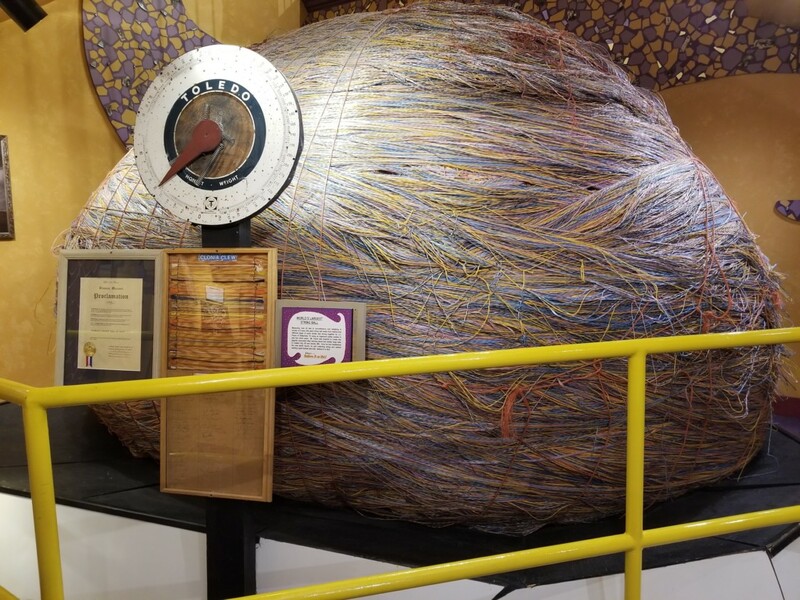 As of the end of November of 2018, Clover says the ball weighs in at 20,508 pounds, but she still has a couple pounds left on a spool she’s currently wrapping on to it. Though the length of the twine is slightly harder to estimate, Clover says the ball has over eight million feet of twine fed into it, and it grows almost every day. Every third weekend in August is dedicated to the town’s Twine-A-Thon to continue building the ball – Friday is spent wrapping twine while the next day brings a parade and festivities. “It’s small town America fun,” Clover says. Elsewhere in the Midwest, three twine balls compete with Cawker City’s. Darwin, Minnesota’s has been said to be in direct competition but should be considered a different undertaking. Darwin’s was built by a single person, Francis Johnson, who stopped rolling in 1979, a decade before his death. His ball measures in over 17,000 pounds. In Lake Nebagamon, Wisconsin, a third twine ball is located in its creator’s backyard, a bit off the beaten path. James Frank Kotera, who likes to call himself JFK, is another sole roller declaring that his is the largest based on weight, claiming his ball weighs in at over 23,000 pounds, making it at least the heaviest. JFK is the only living ball roller and is still adding to his. The final ball weighs in at a low 13,000 pounds and resides in Ripley’s Believe it or Not emporium in Branson, Missouri. Small size aside, the ball stands out in a couple other ways: Its creator, J.C. Payne, was from Texas originally and didn’t mind selling to ball to reside outside of his home town. The material is different, more akin to string than the farm twine that comes wrapped around bales of hay and straw, and Payne was said to have had some sort of mechanism to help ball the twine quickly to allow him to beat the record at the time, then stop production and sell it to the highest bidder. Ripley’s, of course, is the only one to make money off of big twine balls, as per their business model. Dixon says he’s certain the ball isn’t going anywhere anytime soon, partly because it brings people in, but mostly because it literally cannot. Ripley’s was actually built around the ball, and removing it would likely involve knocking down walls and using a crane. Sometimes that means stopping in a town known for its world’s largest items or one of the Midwest’s four different claims to the World’s Largest Ball of Twine. The Midwest may not be any more of a tourist trap than any other stretch of open highway, but its attractions are bigger and, in its entirely biased opinion, better.